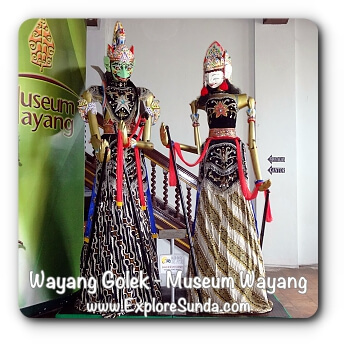 Museum Wayang was officially opened on August 13, 1975. However, the history of the building commenced centuries ago. Once VOC conquered Banten near the Ciliwung estuary, it built a city complete with the fortress. The city was called Batavia. Then in 1632-1640 it straightened Ciliwung river and built a church on top of the reclamation land. The church was named De Oude Hollandsche Kerk (The Old Church). Since the foundation was a cross-shaped, it also known as the Cross Church. However, this reclamation land was not solid enough, hence, 30 years later the building had deteriorated. But the church was still used until 1732, when it received a large orgel that could not be put inside. This Old Church was demolished then and they built De Nieuwe Hollandsche Kerk (1736-1808) on the same site. The new church was much larger and for years it was the tallest building in Batavia. The foundation was octagonal and had 700 pillars to support it. Based on its shape, this church also known as Gereja Kubah (Dome Church). 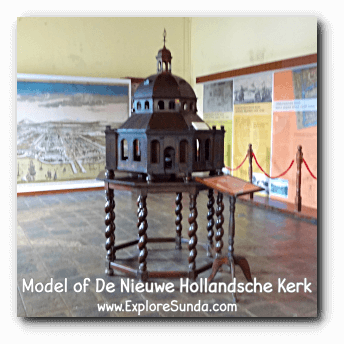 The wooden model of De Nieuwe Hollandsche Kerk. It was believed to be made in the 19th century, but there is not any information on the purpose and who built it. Today it is displayed in Jakarta History Museum. Brick walls, granite stairs and 16 tall windows were some of the luxury shown in this church. However, one unhealthy tradition was still kept from the old to the new church: they buried the dead inside the church, so their tombstones became the floor. Other Europeans also questioned this tradition, because it could spread infectious diseases. The next surprise came from the contractor of the building. Instead of an architect, the designer and builder of this grand building was a baker! No wonder it was damaged when an earthquake hit Batavia on July 22, 1739. Nevertheless, it was still functioned as a church until 1808. That year Governor General Daendels instructed to dismantle many buildings and fortress in Batavia, including this church. The materials were used to built a new city in Weltevreden (Lapangan Banteng today). The new chapter of this place started when it was no longer used as a church. The site and what was remained of the building was sold to Geo Wehry & Co, a Dutch trading company. The tombstones were moved to Kerkhoflaan. 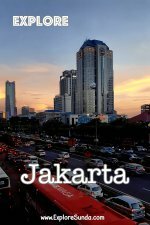 Today it is called Taman Prasasti on Tanah Abang Street, Jakarta. In 1912, Geo Wehry & Co built a Neo-Renaissance style building on this site and used it as the office of the company. Later on, it was sold to Het Bataviaasch Genootschap van Kunsten en Wetenschappen (the Batavia Society of Arts and Sciences). Next, in 1939 it was transferred to Stichting Oud Batavia (the Old Batavia Foundation), who used it for a museum named Oude Bataviasche Museum (the Old Batavia Museum). 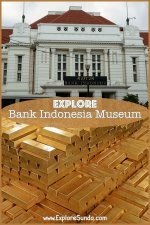 In 1957, the museum including its building was transferred to Lembaga Kebudayaan Indonesia (the Institute of Indonesian Culture) and the name was changed into Museum Djakarta Lama. 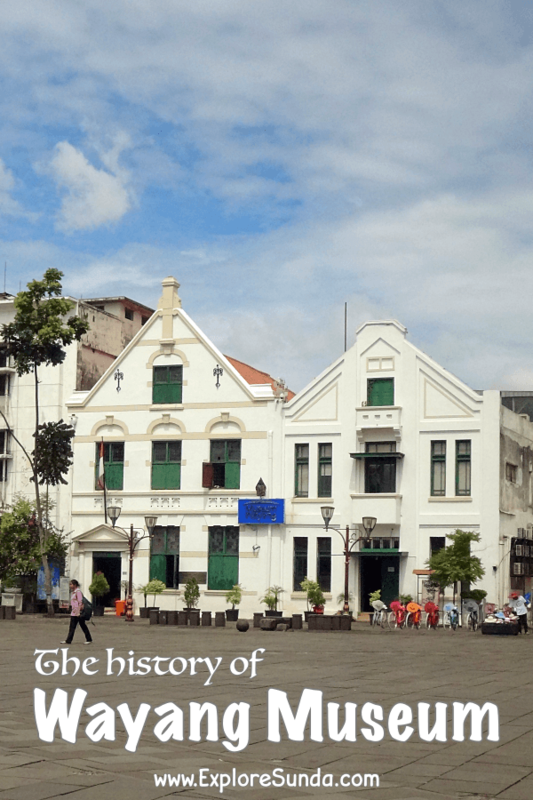 Later on, Museum Djakarta Lama was moved to the ex-city hall building and the name was changed into Museum Sejarah Jakarta (Jakarta History Museum), but also popular as Museum Fatahillah. Finally, starting August 13, 1975 this former church becomes Museum Wayang (Puppet Museum). 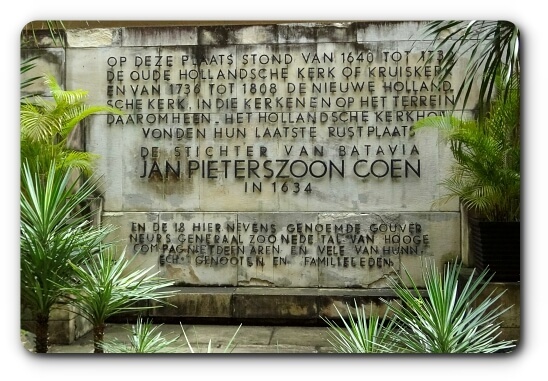 Since the site used to be a church with a lot of graves and tombstones on the floor, today, the display of Museum Wayang includes some tombstones of the famous people who once upon a time buried in the church, such as the late Governor General Jan Pieterszoon Coen. Of course, they are the tombstones only, while the remains are still buried in Taman Prasasti. The remaining of the displays, which are the majority, are puppets from all over the world. 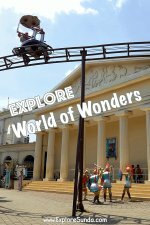 Have you explored it?